As I mentioned a few weeks back, I found myself in a dilly of a pickle one night when my slow cooker failed to cook slowly and I needed something to feed my family. I looked in my fridge, saw a packaged kielbasa sausage, some chicken stock, half of a head of cauliflower and figured I could make something work. 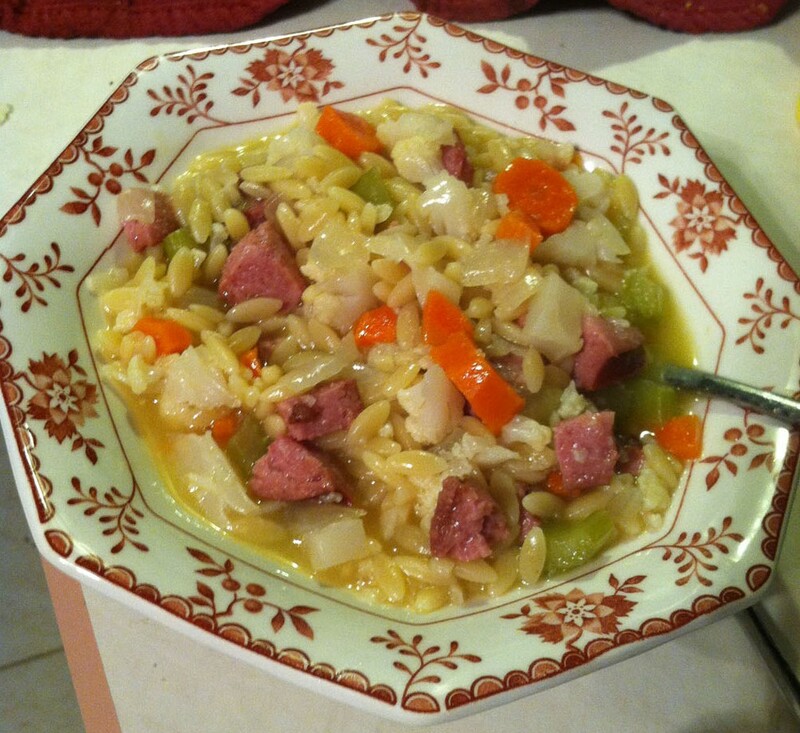 My initial idea to make a soup with the kielbasa was partly influenced by a slow cooker recipe I’ve made from Good Housekeeping called Kielbasa Stew. I had an idea that these basic flavors would work together. The red wine vinegar and ground mustard just came to me and wound up working really well to add some tang to the recipe. As always, I did all of my prep first which meant chopping up the vegetables and then the meat. I got the veggies cooking in a few tablespoons of olive oil as well as the red wine vinegar until tender in a Dutch oven which took about five minutes. Then I added the sausage and cooked that for another five minutes, until it browned. After that, I covered with chicken stock, added the ground mustard and brought to a boil. Once the liquid started boiling, I added in the orzo, gave the mixture a few stirs and then popped the lid on for 10-15 minutes until the orzo was cooked through. Once it is cooked, you’re good to go. I happened to have some canned Sauerkraut in the pantry, so that seemed like a natural accompaniment.